Following incredible success with their Teenage Mutant Ninja Turtles line of toys, Flair released the amazing Zip-Line toys that can be used by any or all of the famous characters. Each of the four playsets can be used independently or joined together to create a fantastic chain reaction where the Turtles literally ‘fly’ between each scene. These wall mounted sets feature ‘easy snap-and-go connections’ and can be set up for virtually instant use. Kids can choose from the Billboard Breakout set, Water Tower Washout, Fire Escape Free Fall or the Window Wipeout set. For maximum fun join all four toys together and create mayhem and carnage as Leonardo, Donatello, Michelangelo and Raphael zip across the room taking care not to crash into each other! Teenage Mutant Ninja Turtles Zip-Line toys join a great line up of other products that include the infamous Shell Raiser Vehicle, the Secret Sewer Lair or the Pop-Up Pizza Anchovy Alley playset. Kids should also check out a great range of Turtles role play toys as well as some fascinating arts & crafts sets. 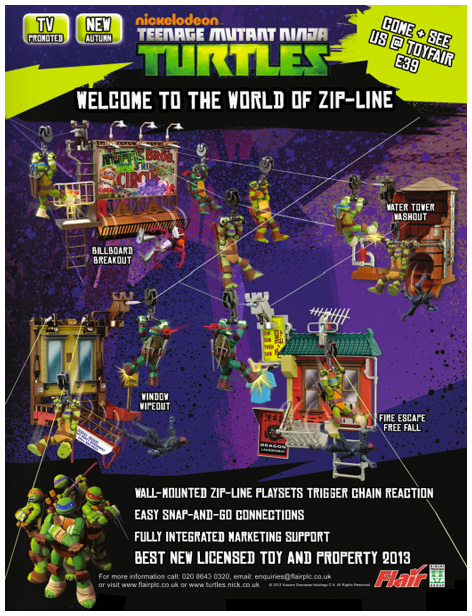 Please tell us what you think of the Teenage Mutant Ninja Turtles Zip-Line by Flair.